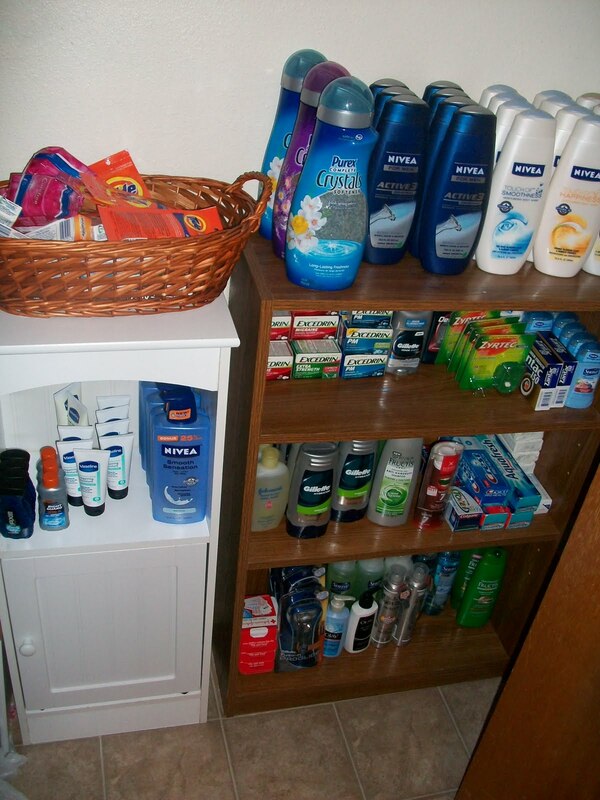 My Bathroom Stockpile and some Advice for Newbies! Just wanted to show you part of my stock pile. My husband is working on shelves in our garage so as soon as he’s done and I have things organized I will show you the rest of my stockpile. Just wanted to show you how you can get a ton of stuff for mere pennies on the dollar by using coupons. Not just using coupons, but knowing how to use coupons. Obviously clipping one .50 coupon is not going to help you. You need multipule coupons and a great sale. The best advice I can give any newbies is to get the Sunday paper and watch sales. The trick to huge savings is combining the right sale with the right coupon. Here’s a break down of how much the retail price is for this stuff and how much I paid. It’s apx $400 retail, I paid about $50 if that. Excedrin sale $1.99 had $2.50 off coupons so free plus overage (overage is always a good thing). Gillette Fusion Razors are about $14 retail I got them for .89 each after sale, $4 off coupons and register rewards @ Walgreens. I also get a ton of travel sized items super cheap or free. If the coupon has no size restrictions you can hit the travel section and score some pretty sweet deals. Great for travel or gift baskets. Some things I really like to stock up on are Laundry soap, dish soap, and fabric softener. Try to find coupons for items you frequently use and when you find a great sale and stock up! Also, try new products, don’t be brand loyal. Some of the best coupons ( high dollar ones) are for new products. Watch money saving blogs (like this one) for weekly coupon match-ups and then use a clipping service if there’s a certain coupon you need. It will be well worth it.